See what I did there? I got your attention with a photo. Facebook marketers use the same technique to capture their target audience’s attention as they browse social media. But great ads are more than just enticing images. 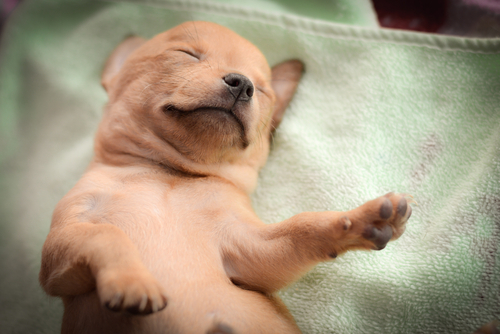 Once you get past the hurdle of getting your images seen on Facebook, you need to craft some clever copy to get your audience to click on your ads – and convince your audience there’s more to this post than just a cute puppy. Here are five tips for creating copy that gets people to click again and again. 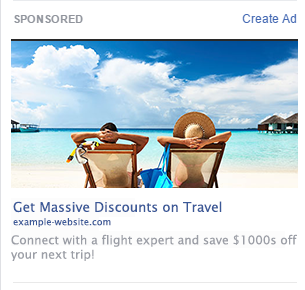 I worked for a company that helped people find cheap flight tickets, and our goal was to create awesome Facebook ads got as many clicks as possible. To figure out what worked best we ran a quick A/B test. We launched two ads, with identical images and the same description, the only thing we changed was the headline. The second headline was written originally as a joke, to reflect how we were actually feeling during the cold winter months in Canada. Sick of being cold and pale? Can you guess which headline performed significantly better? It’s also been proven that people prefer something surprising and different. ABC news reports that the brain’s pleasure centers react more when we experience unexpected pleasure. We may mechanically respond to certain formulas and buzzwords, but when it comes to creating engaging ad copy, something unpredictable can have a more effective response. Quirky and creative ad copy works well if you’re in the B2C space, but for B2B ads or professional services, it’s probably better to be a bit more straightforward. Claire Pelletreau, a Facebook Ad Consultant, says the key to copy that gets clicks is to just to be clear. Tell your audience exactly what it is you’re offering, without the bells and whistles, and you’ll increase the likelihood of getting a click. If people aren’t sure what it is they’ll get by clicking your ad, they simply won’t take the chance. Clarity = clicks. In one example from Pelletreau’s post, a business owner saw success with her text only ad, no gimmicks or flashy images needed. By narrowing in on your target market, and making sure that only the people you want to reach see your ad (those in your industry, age bracket, demographic, interests etc), these simple and direct ads can have high click through and conversion rates. 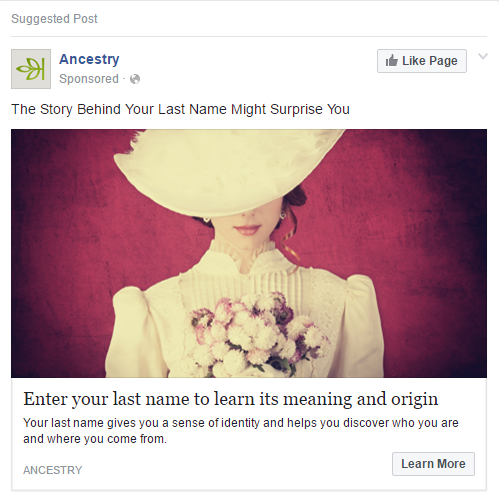 In the example below, Ancestry.com makes the headline both clear and enticing, which gives people the confidence they need to click. I’ll admit, I fell victim to this bit of inviting ad copy, and clicked to see what my surname, Zacchia meant. Our brains react differently to surprise, which means we can be jolted out of a daze by difference. Put simply, numbers stand out to us. That’s why we love list posts, and that’s why this post specifically is broken up into five numerical sections. Here’s what Maria Konnikova says about it, writing for The New Yorker. A good numerical headline can be very engaging. Take a look at the image below. 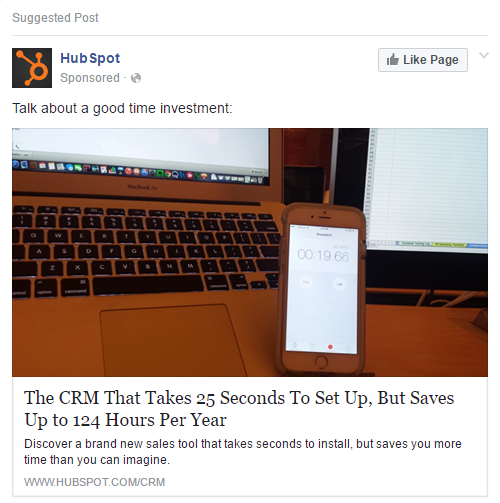 This ad from Hubspot helps convince viewers to click with stats, saying it takes only 25 seconds to set up and saves 124 hours a year. These numbers provide the type of proof users need to make the decision to click or not. You know how important the photo or video is, and you know how important the headline and text can be. The next major piece to the puzzle is the call to action button. When you build an ad on Facebook, depending on what type of ad you build, you’ll have a different call to action button. 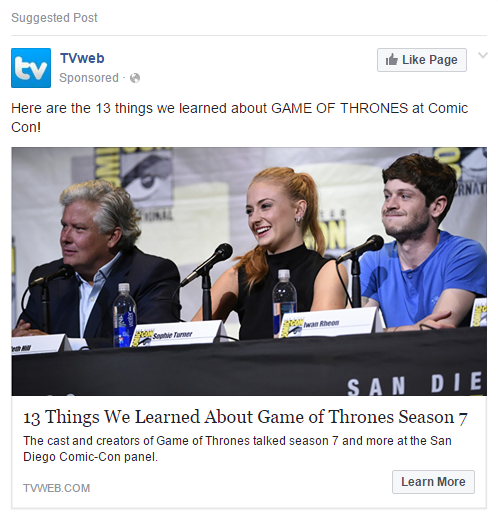 Traditional ads will have the CTA, “Like Page” or “Learn More” or both. 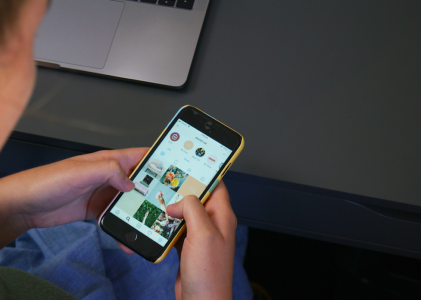 According to Antonio Calero, social media strategist, “Learn More,” is especially effective because it activates curiosity, and acts as an important motivator. It has also been proven that “Learn More,” helps improve click through rates. When Calero compared “Learn More,” with “Shop Now,” he found that while one had significantly higher CTR, the other was much more effective at getting conversions. Other ad types offer different CTA buttons, like “Shop Now,” that are more reflective of what you’re trying to promote in the ad. For example, Amazon’s product ad has a call to action that reads, “Shop Now,” and leads all those who click to a specific landing page with the products advertised. These more aggressive CTAs help dissuade browsers and encourage only serious conversions. The call to action, determined by ad type, has to make sense with the ad, and objective. The text and image all correlate with shopping, so the “Shop Now” button makes sense. And the text provides all the information a person would need in order to make a decision as to whether they can attend or not. Other CTAs include: “Sign Up,” “Get Offer,” “Download App,” and more. But having the call to action button isn’t enough. Your text needs to be aligned with the action you want your audience to take. 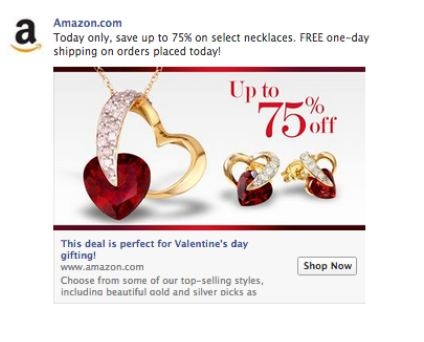 Amazon’s ad sells the 75% off deal on jewelry, encouraging people to shop. 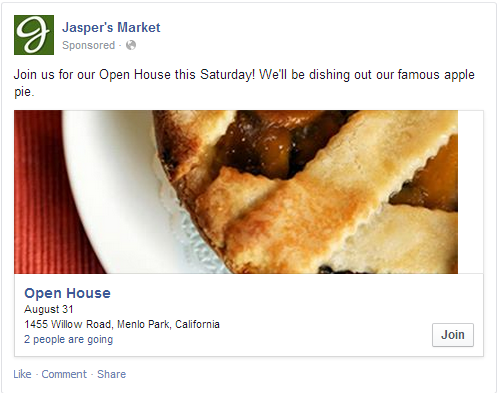 Jasper’s Market includes all the details for their upcoming event and asks people to join and enjoy some delicious apple pie. The copy you write needs to align towards the CTA, and encourage people to click with creative headlines, simple straightforward copy, and numbers to grab their attention and convince them to click. So you’ve written and launched the ad, congrats! You didn’t think you were finished just yet, did you? The very last step to the ad copy process is to run tests and make adjustments. All marketers and writers know that nothing is ever finished, there’s always more revisions and improvements to make. The best thing to do when launching ads is test different elements to isolate what works best. 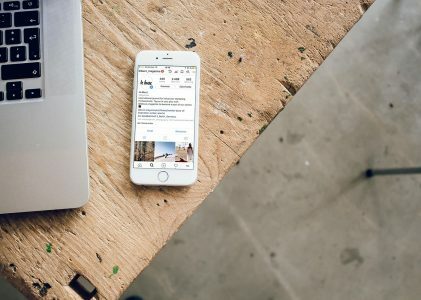 For example, in step one we looked at how a simple comparison of headlines could help reveal what content people connect with. From there, once you’re confident in your headline, you can test the rest of your copy. Maybe try simplifying the text, or add numbers to create a list post or act as reinforcement for the point you’re trying to make. Last but not least, if possible, test different Facebook ad types to try different call to action buttons and adjust your your text to point people towards the actions you want them to take. After every test you run, once you determine a winner, create a new test. It may seem daunting, but if you want to get as many ad clicks as possible, you need to put in the time. 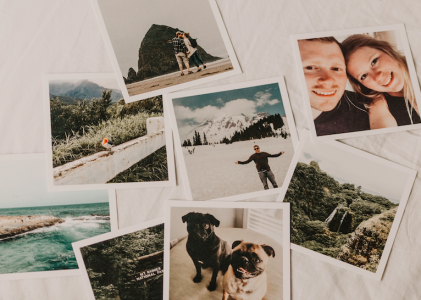 Photos are great at attracting attention on Facebook, but in order to get ad clicks or generate conversions, you need strong ad copy and a CTA button that sells. Don’t just rely on formulas or humdrum copy. Creative and surprisingly content is proven to provoke a stronger reaction in people. Straight forward content works. Your audience will be more confident in the ad they’re clicking on, and will be more likely to click. Whether you use numbers as a list or as validation for your business, they can work to help give people the assurance they need to click your post. Experiment with different ad types in order to try different call to action buttons, depending on the goal of your ad, and make sure your text is aligned to push people towards the CTA. Once you’ve created an awesome ad, do it again, changing one variable at a time, and test which one works better, over and over to continuously improve the number of clicks and conversions you’ll get. There are dozens of other strategies to get more clicks on your Facebook ads, if you know a few we left out, share how you make your Facebook ads more clickable in the comments.